First Grade Fraction Talks... What? 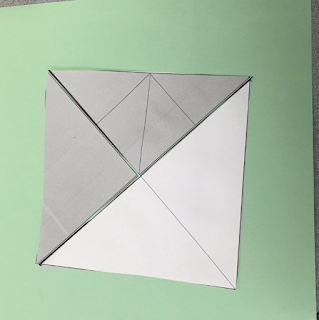 Since the idea of fraction talks first came through my twitter feed, I was intrigued. My first thought, was, "Oh, that's so cool for the big kids." My next thought was, "Hmm... 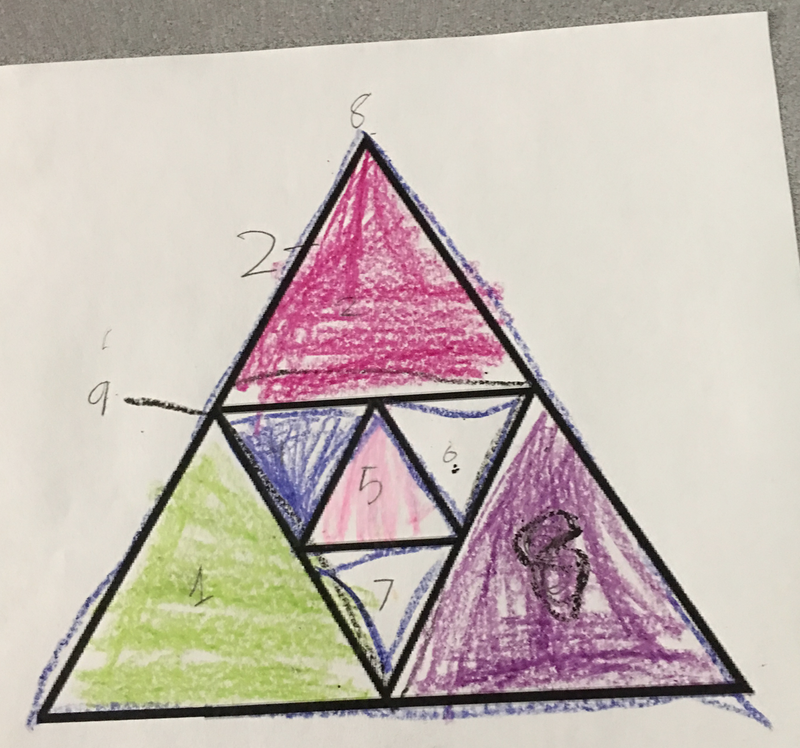 Some of the best learning my first graders have done has happened when I've stolen ideas from upper grades. 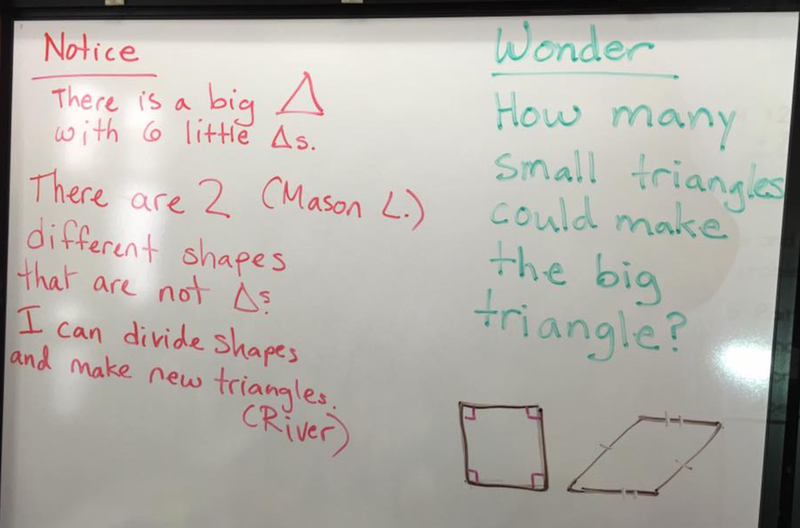 I wonder what ideas I can steal here that would benefit my student's mathematical understanding?" My colleague, Allegra once said that teachers are like swimmers, and there are three groups of swimmers. The first group dives in and explores and pilots new ideas. The second group watches the first group to make sure they do well and make it to the other side. The third group won't stick a toe in. They say, "No way! Not gonna do it!" I am totally a swimmer from the first group, so I dove in... and here is what happened. 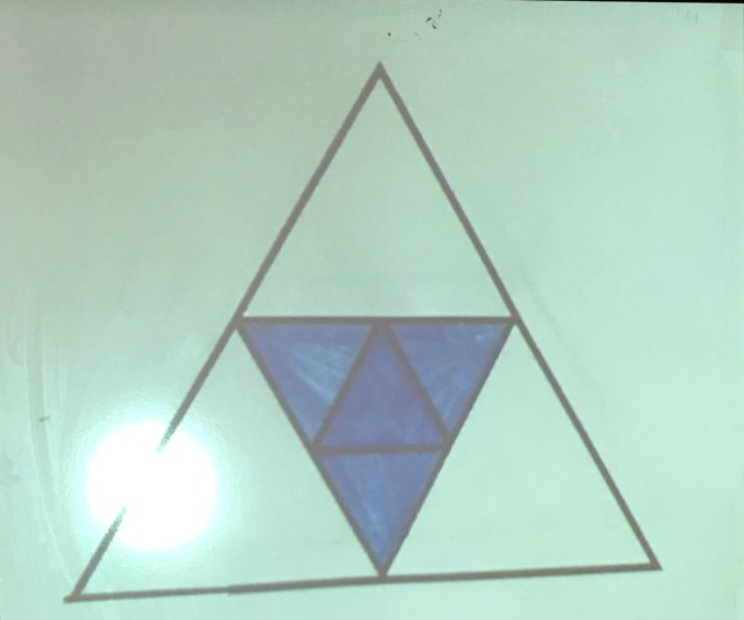 I displayed this image on the board. Actually, when I first put it up there was no line down the middle of the white triangle. We began with lots of partner talks about what we noticed, then shared with the class. I charted a lot of the responses. They said things like, "I notice there is a big rectangle. 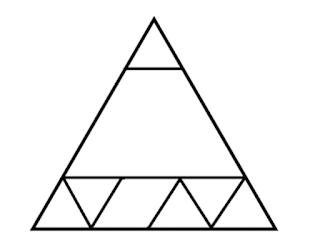 I notice there are three big triangles and four little triangles. 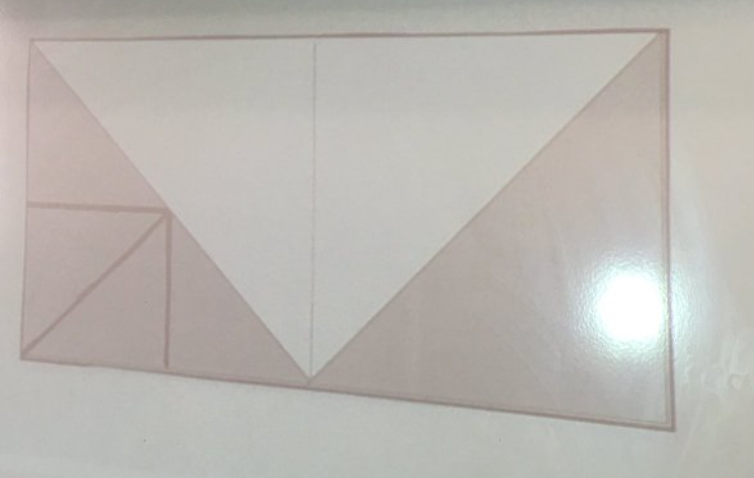 I notice there is a square. I notice some of it is shaded." I asked them how much of it was shaded. At first kids said 5 or six. Do you see the five or six? Then I asked, "Is there a way to tell me how much is shaded without counting?" Then one boy said, "half." The kids disagreed at first... a lot. Then he explained by asking me to draw a line down the middle of the white triangle and he explained that the rectangle was broken up into four equal parts. Then more kids started to believe him. 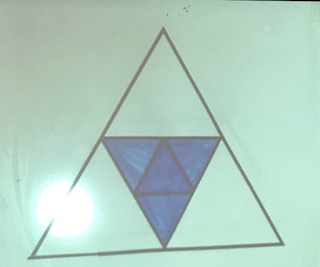 I think the kids that didn't have a hard time understanding that those smaller triangle were equivalent to one bigger triangle. The kids said they wanted to move around the parts so I printed out the shape for them. Then they cut them out and glued them in a way that made sense to them. One thing I learned here was that most kids think that for things to be half they need to at least be grouped together and if they're not, they want to move them that way... at least for now. 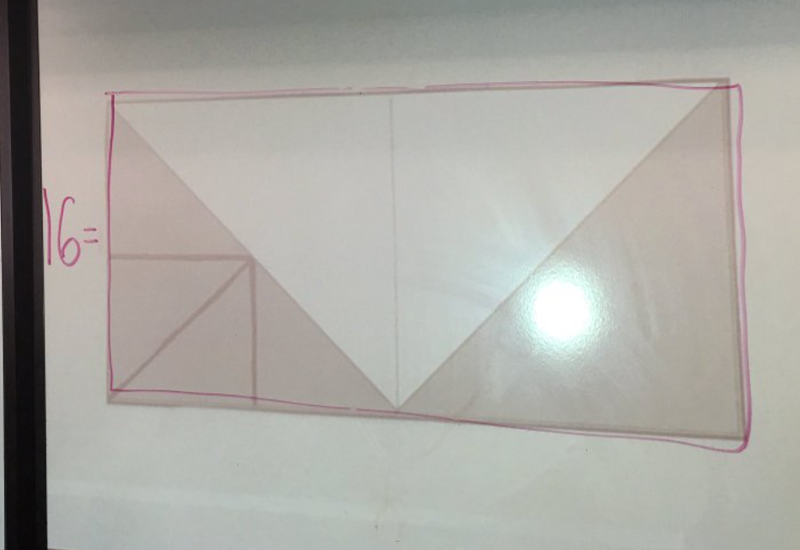 I referred to the same rectangle we started with and asked, "What if the large rectangle was equal to 16? What would the other parts be worth? Kids used their rearranged pieces to show what each part would be worth. Some wrote equations. Everyone talked. Notice, I did not record half or fourth in numbers. 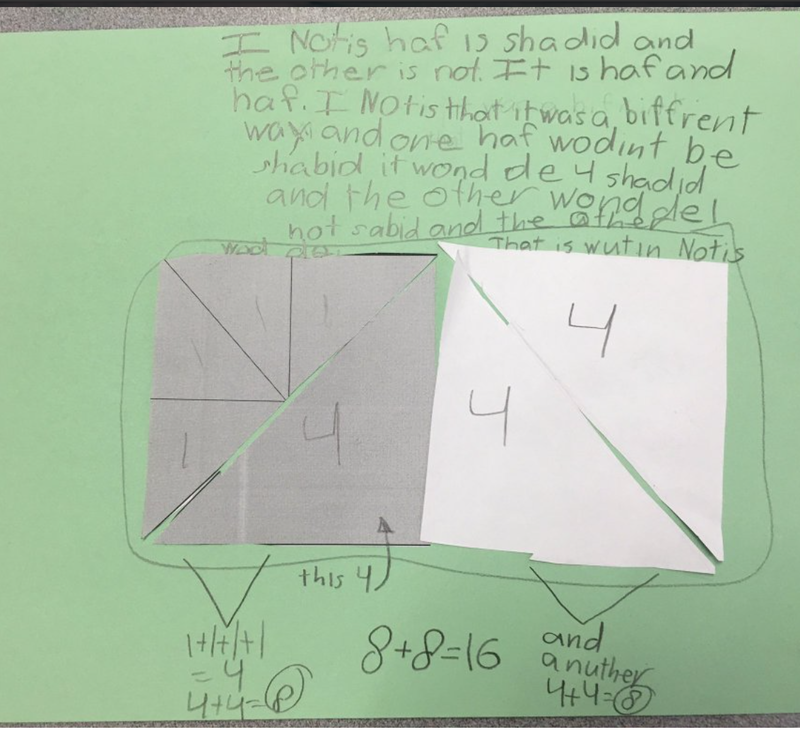 The first grade CA math framework states that numerical representations of fractions will begin in third grade. Initially I just displayed the figure and asked the kids what they noticed. 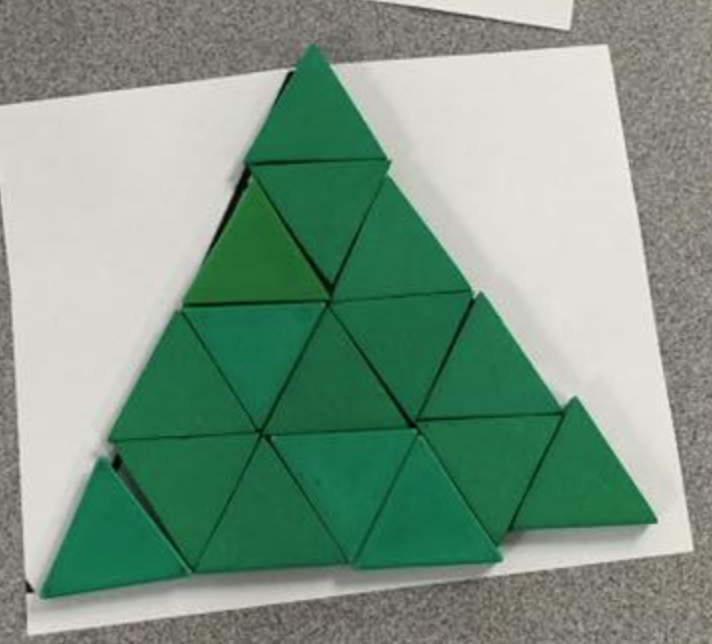 Most counted how many triangles there were, some missed the center triangle. 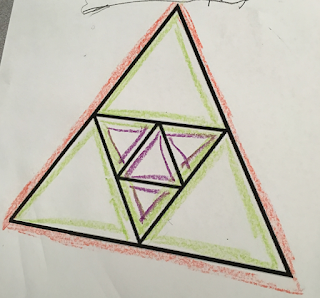 Students wanted their own copies to draw on to count the triangles after our initial discussion. Again, I asked how much was shaded. 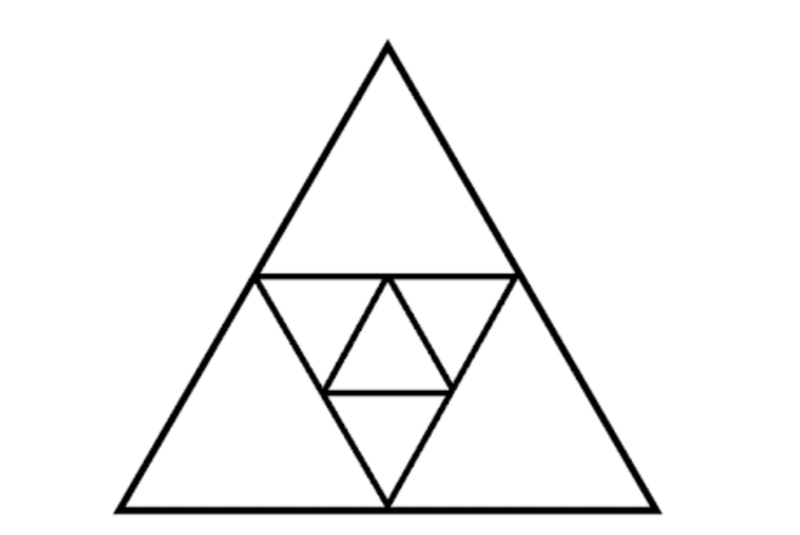 Similar to the previous fraction talk some said 1 out of 7, 8 or 9 triangles. So then, I showed this. 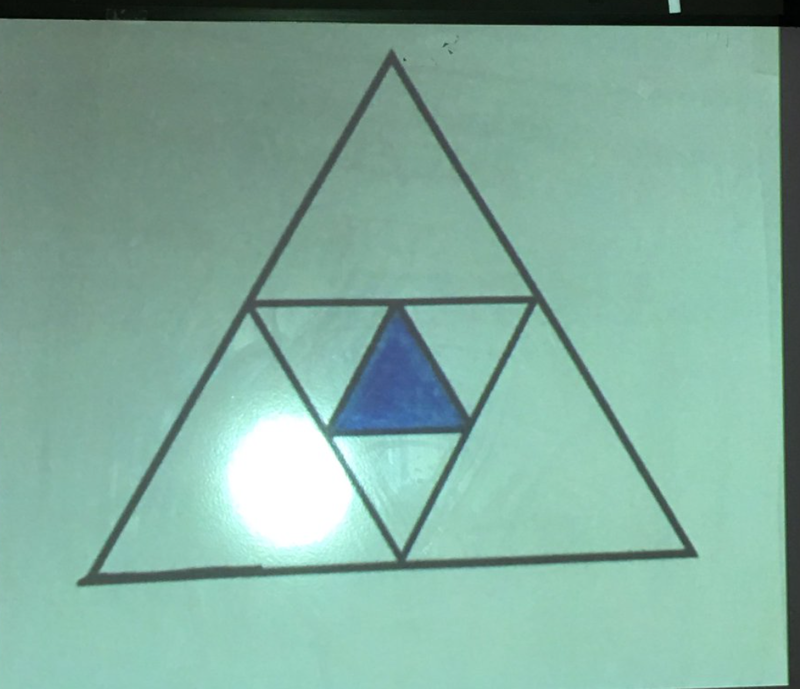 Now students could clearly see the four medium sized triangles and they said one fourth of the triangle was shaded. So then I showed them this one. 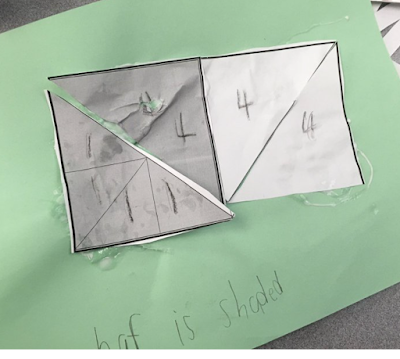 They argued a little, but settled on it being equal to half. 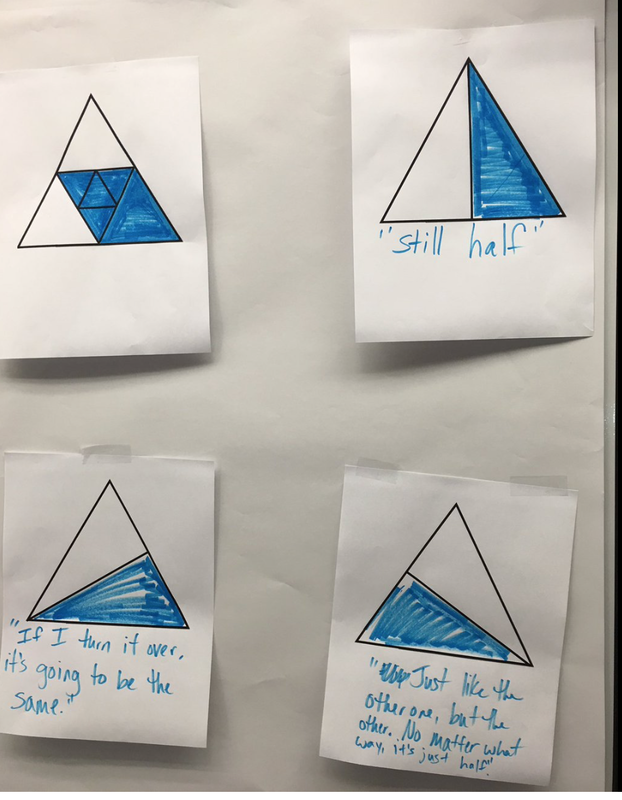 Then the class compared other familiar ways of showing half on a triangle. I was trying to get at the idea that there are different ways to compose shapes and really numbers too. Then I went back to this image, and asked again, "How much is shaded." Pretty awesome. One fourth of a quarter. Partner talk it out kids. I printed out student copies to the scale of our pattern blocks. 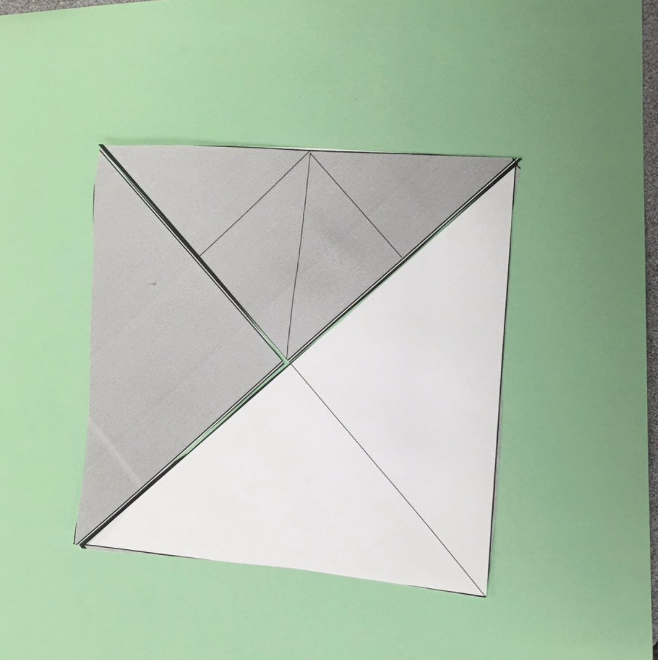 At first kids just used the small triangle size. So then we gave the largest triangle a value of 16, because it took 16 of the smallest triangles that we had to make it. 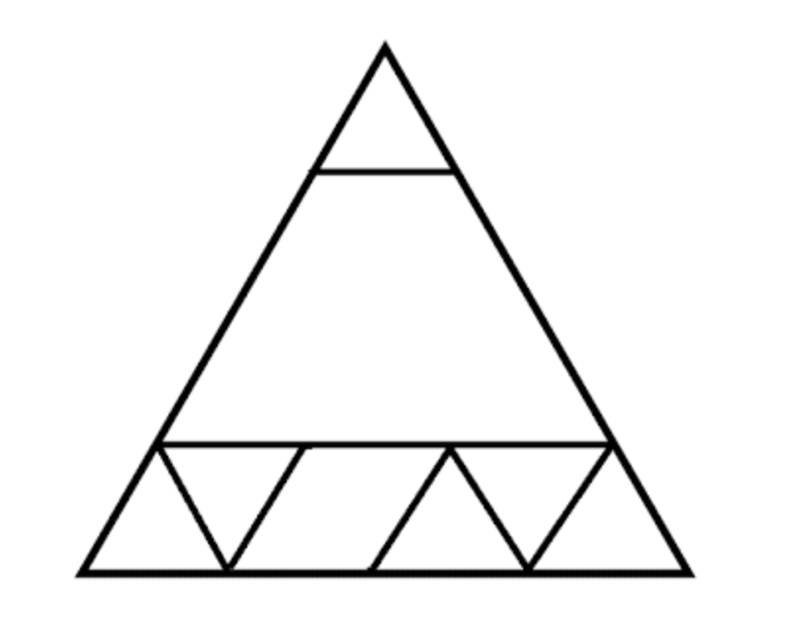 Next question, "So if the large triangle is equal to 16, how much is the large trapezoid worth? What about the rhombus?" Kids used their tangram pieces to count that out. 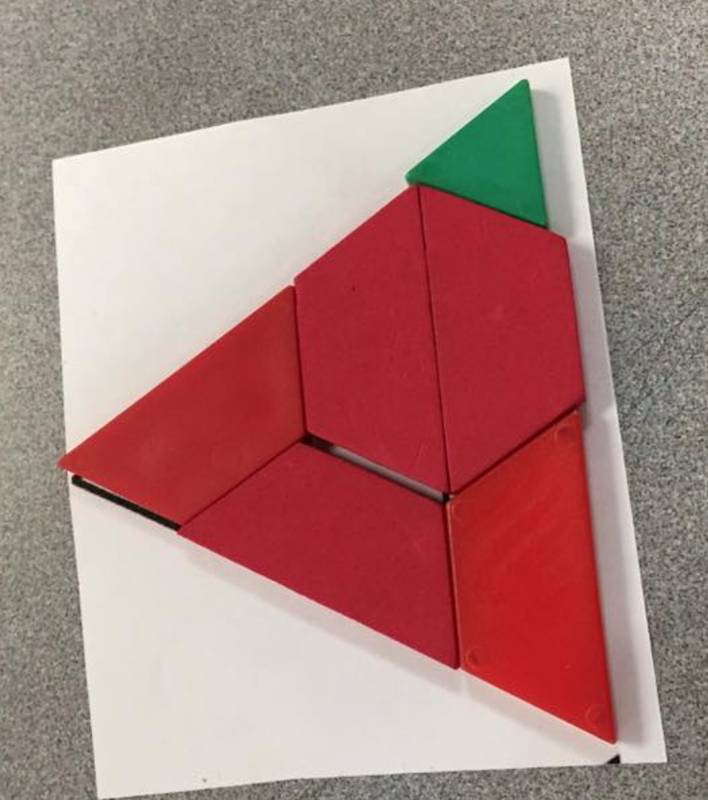 Many students layered shapes on top of other shapes to make sure they got it right. "So how much space does the trapezoid take up in the largest triangle?" Kids said 8. "What do you notice about the value of the trapezoid and the largest triangle?" Kids, "One is 8, one is 16." "Okay, what do you notice about those numbers?" Kids, "16 - 8 = 8." Me, "Thank you, what else?" Kids, "8 is part of 16!" Then another kid shouts, "I get it! 8 and 8! It's half! 8 and 8 are doubles!" Lots of partner talks. 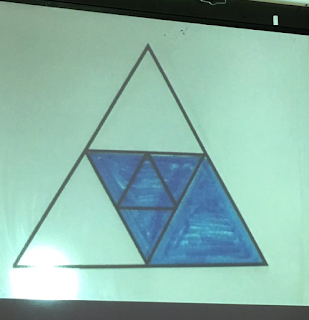 "Can we write an equation about the shapes in the triangle?" 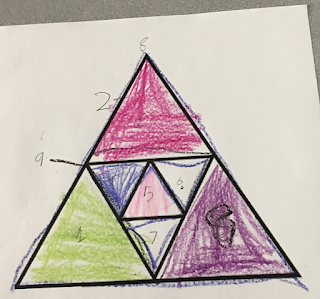 Kids responded, telling me to write 8 for the trapezoid, 2 for the rhombus... then we had a conversation about how to represent all of the small triangles. We decided to write them each out to represent each triangle. 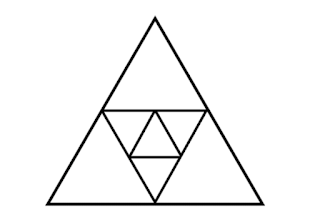 Me, "Is this the only way to build this triangle?" Kids of course say no. Then I let them create the same size triangle using whatever shapes they can, but I also ask them to write an equation to represent the shapes in their triangles. 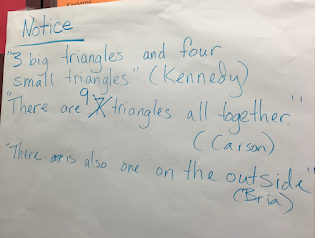 After creating their own triangles and writing equations to represent them, we did a gallery walk to look at all of the different ways they could do this. 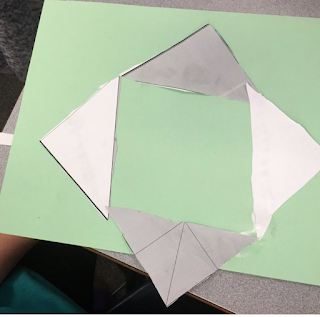 When asking the kids what they noticed, they said they were all equal to 16 - there are different ways to make shapes and numbers. 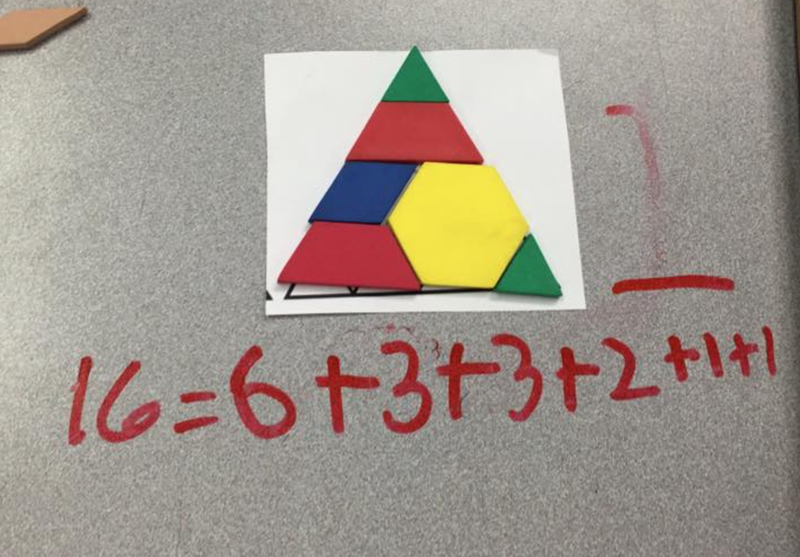 Kids said they didn't know they could use numbers to represent shapes. I think there were some very big ideas that came out in the fraction talks we've done so far. I've noticed, ideas that support addition properties, equivalence, unit, composing, decomposing numbers, part - whole relationships. One thing that really struck me over and over and over again today was how much INCREDIBLE discourse was going on! I did a poor job of capturing it, but honestly, I would have to record the whole lesson for you to grasp the discourse. I have never had kids argue about math so much as I have in these lessons. Honestly, that is something I am always trying to encourage, and when we've done these lessons, I've had to rethink what protocols need to be in place to not only argue, but to listen more closely because they are all so excited they can't contain themselves. So, in short... You must allow your students to talk a lot, like a ration of 95:5 Students:Teacher. 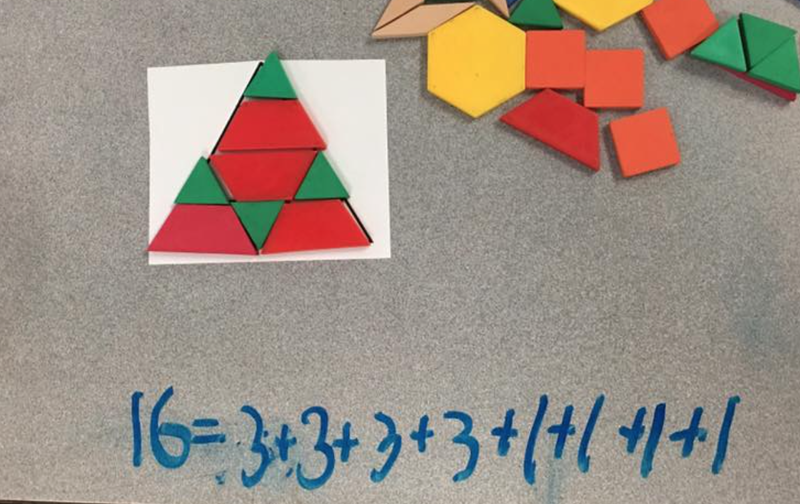 There is a profound opportunity for students to chip away at their understanding of defining shapes, composing and decomposing numbers, algebraic reasoning and fractional thinking. 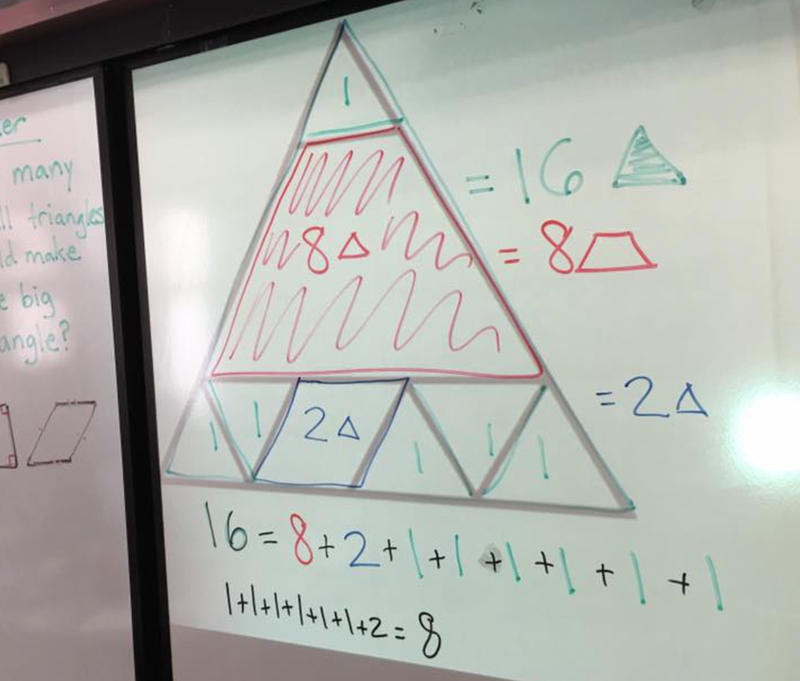 I felt like this lesson could take up my entire math block of an hour and a half, so it was important for me to keep my mathematical goal in mind, but some things you just can't ignore. I don't think I am a pro at this though. This is me learning and playing with ideas for teaching and learning. I plan on integrating fraction talks on a regular basis next year after learning about the incredible reasoning that comes out consistently! So please, don't hold back! If you have ideas of questions I should ask or anything, please tell me. Honestly, I am writing this post to ask for help to do a better job... and to maybe inspire other K-2 teachers to take a dive. This is the time of year to try things out! Thanks, Allegra! I think I have some work to do to get better. I'm kind of testing the waters. I think fraction talks will do for geometry (and other domain) what number talks do for OA and NBT. It will permeate everything else. 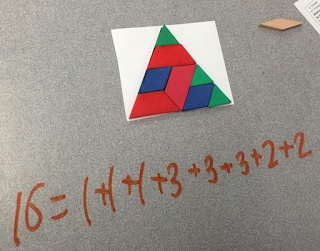 I love how you'll be incorporating Fraction Talks on a regular basis. Can't wait to read more! That is a powerful blog post! Thanks for sharing this, Jamie. There are so many great thoughts to work with here. The instructional move to label the rectangle as 16 (rather than 1 whole) is extremely helpful. So often, students eventually arrive at the misconception that a fraction is always less than 1 (and greater than 0), and that can happen because we often frame fractions within the context of 1 whole, so students arrive at an understanding that a fraction must be a part of 1. yet, here you've begun with 16. Not only is that a great move, it's also really important. Thanks for sharing all of these ideas. I'm learning as you share and I love it! It kind of felt like there were too many good thoughts, so many that I didn't even write about. It was hard to stay focused on the goal. I think doing it all year along with number talks, estimation tasks, and visualizing number patterns would be awesome. I chose sixteen because of the squares in the corner and our standards deal with halves and quarters. The kids are really amazing! Bravo, Jamie. 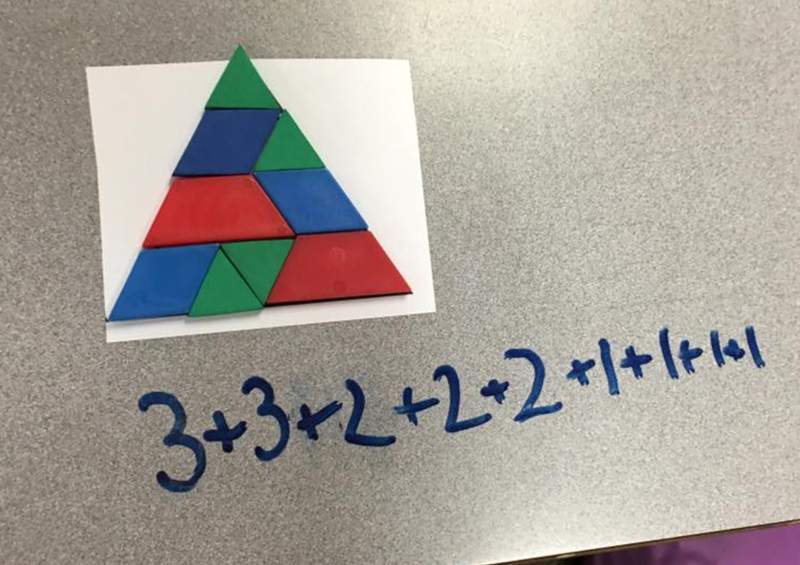 Not only are you building their conceptual knowledge of fractions, you're also teaching reasoning, debate, and how to look at an ordinary object (triangle) in a different way. Thank you! The reasoning and discourse is what this is all about! Jamie, your students have done tremendous work! 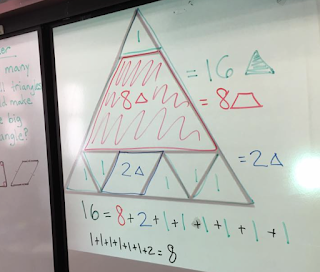 It's inspiring how you've provided them with a rich, multidimensional maths task, asked them to notice and wonder, and look what they're doing! Thank you so much for sharing! Thanks, Chris! I'm honestly JUST learning about this. I think it's a great opportunity for the kids to expand their thinking! I'm excited to integrate this practice next year. 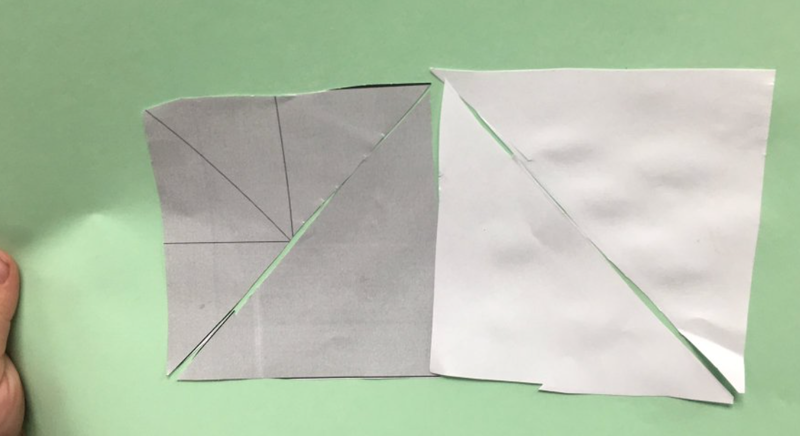 "Then he explained by asking me to draw a line down the middle of the white triangle and he explained that the rectangle was broken up into four equal parts. Then more kids started to believe him." Seeing another way to see the same thing, that convinces others! And I can see it just built up from there - what a great series of lessons. I want everyone to see this! Keep on jumping in and swimming! It really was an exciting moment! It was a prime example of the value of the kids teaching each other! My kids are amazing! I am trying to work within our standards while carefully opening things up to ideas that will be developed later. I kind of picture myself as a gardener and the questions I ask are seeds the will grow later. Wow! Nicely done...I love how it was clearly noticeable how you let the students lead the discussion. Can't wait to try this tomorrow! Thanks Emily! I really didn't know what to expect when I first started, so I just asked questions and let them lead. 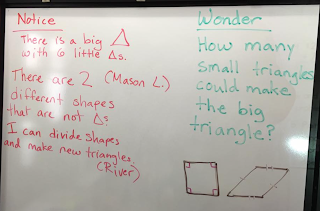 Listening to their thinking helped me learn what learning might be possible in tasks like these. 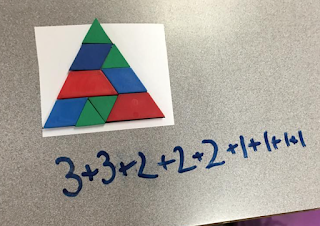 I'm trying to figure out how to plan the use of fraction talks for next year. Once school is out I might be able to think straight again and get some good planning done. Hello! This post was recommended for The Best of the Math Teacher Blogs 2016: a collection of people's favorite blog posts of the year. We would like to publish an edited volume of the posts at the end of the year and use the money raised toward a scholarship for TMC. Please let us know by responding via http://goo.gl/forms/LLURZ4GOsQ whether or not you grant us permission to include your post. Thank you, Tina and Lani. Shoot! Sorry, just saw this. I clicked the link to grant permission, but I'm guessing it's too late??? First Grade Math Fight... Fractions, Proportional Reasoning, and Algebra, Oh my! Copyright Elementary Math Addict. Designed by Georgia Lou Studios. Customized by A Bird in Hand Designs.